This interactive desk sculpture is designed for the bike lover with a day job. Gear up for morning conference calls and afternoon emailing with this interactive desk sculpture for the bike lover with a day job. 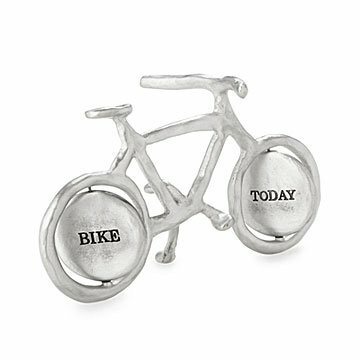 Designed by Tamara Hensick, its wheels flip so you can playfully indicate your current mood or goals: Bike Today/Work Tomorrow or Work Today/Bike Tomorrow. Either way, this piece is a reminder to always enjoy the ride. Made in Rhode Island. Tamara Hensick creates small sculptures inspired by nature, wordplay, and everyday life. Her first piece was a chicken wishbone molded & cast in sterling silver to inspire one to always make wishes. Sculpting in soft, malleable jewelers wax and hardening clays, her original designs are molded and cast in various metals. Her collection of cast pewter, sterling silver, and bronze pieces include nature, figure, animal, and object motifs that bring a saying, idea, or whimsical phrase to life. The manufacturer, exclusive Design was established in 1965 by the current owner's father, an artistic war vet who needed a job. Creatively Yours, their design partner, was started in 1992 as a place where its founder, Donna McKeown, could be creative and bring joy to people through gifts that celebrate their passions. When we were developing this piece with Tamara, we loved the idea of having a kinetic element, which made the piece interactive and also like nothing else we've seen in the market. There's one place—and only one place—where you'll find the Bike Today, Work Tomorrow Paperweight: UncommonGoods. Approx. 5.75" L x 3" W x 3.5" H; 7 oz. It was a unique gift for my son's 40th birthday...who knew his brother would want the same gift for his birthday!!! There's a bicycle on my desk! I was actually planning to send this to someone but when I saw it, I decided to keep it! The bicycle is much bigger than I expected, and heavier too. And honestly, I love having a bicycle sit on my desk. Not a picture of one... but an item actually in the shape of a bicycle. Love it! Purchased for my niece in Houston and she loves it!!!!!!!!!! Purchased for my niece who is an avid bike rider. She loves it and it sits proudly on her desk at work. She couldn't be more pleased - nor could I ! Thank you Uncommon Goods for this beautiful Pewter Paperweight - a lovely, unique piece of art!!!!!!! Perfect gift for my boss! This was the perfect gift for my boss who is an avid cyclist and someone who can buy anything he wants for himself. The look on his face when he opened the box was priceless and the first thing he asked was 'where did you find this?' He has it sitting on his desk as he looks forward to his next ride. Great product for office worker who loves to bike. Very fun for people who would rather be outdoors, but job requires indoor work.